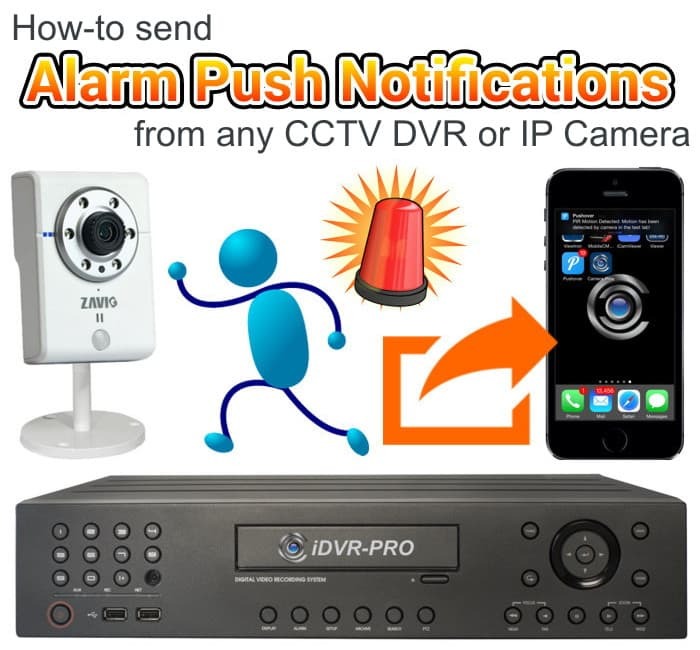 If your CCTV DVR or network IP camera supports email alerts, then you can also send push notification messages to mobile apps from these devices. Pushover, a mobile push message platform for iOS and Android, assigns accounts a special email address. This email address forwards the email message as a push notification to their apps. So, any device that supports sending email can actually send a push notification. Many video surveillance and security equipment manufacturers have not yet gotten around to implementing push message support directly into their devices. However, many DVRs and IP cameras have supported email notifications for many years. 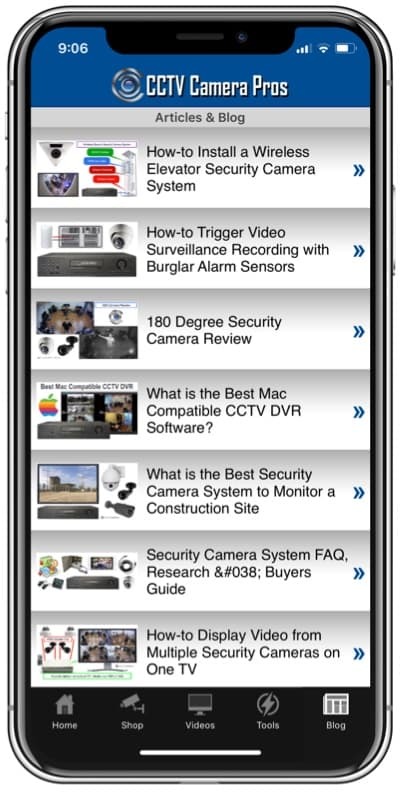 Here are some of the types of security alarm triggers that are supported DVRs and IP cameras. Users typically just need to setup SMTP server settings on their DVR or camera to send an email alert when these types of events occur. The team at CCTV Camera Pros has tested and used Gmail for SMTP service for many years. 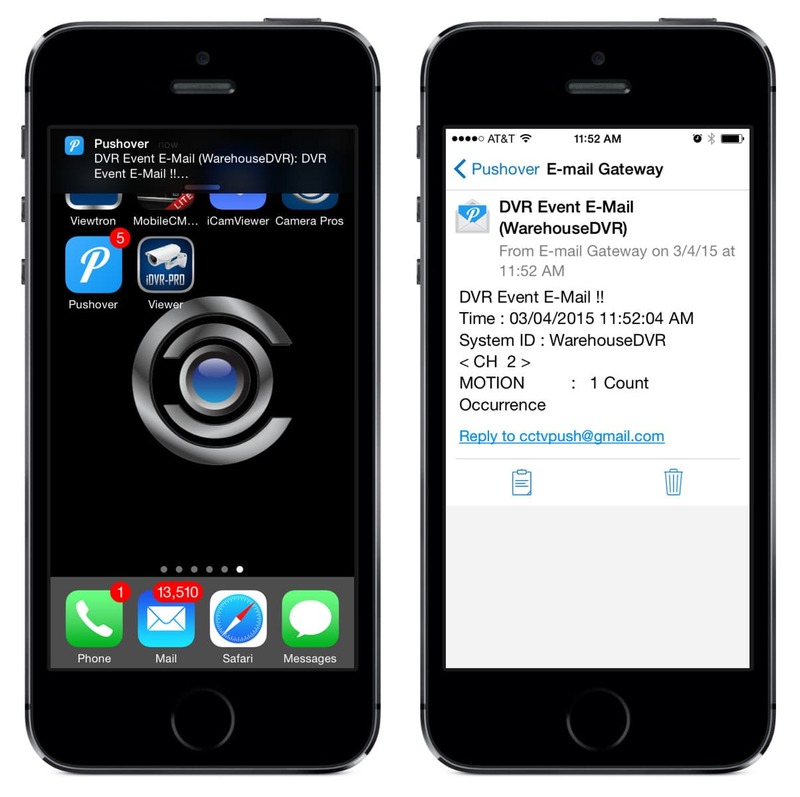 We recently tested the Pushover service, using email to push, on our DVRs and IP cameras and are very happy with the experience. This is what it looks like when a CCTV DVR sends an email alert to the Pushover email to push address. The screenshot on the left shows the push notification being received and displayed on the top notification bar on iPhone. If the user taps on the message, the Pushover app opens and the complete message is displayed. 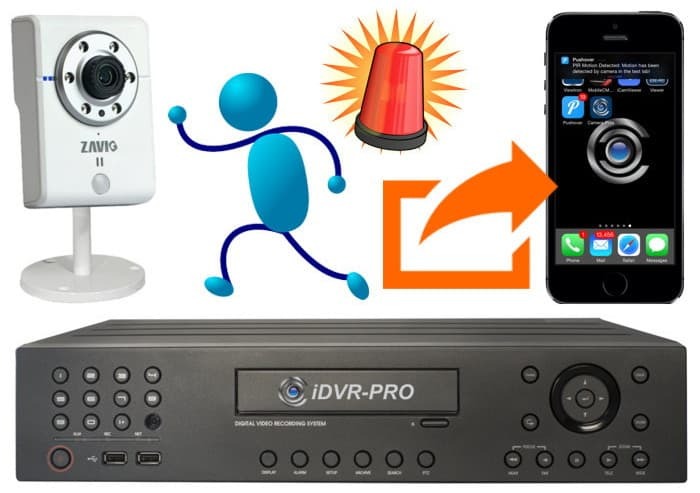 In this case, the message from the DVR is a motion detection alert from camera 2. 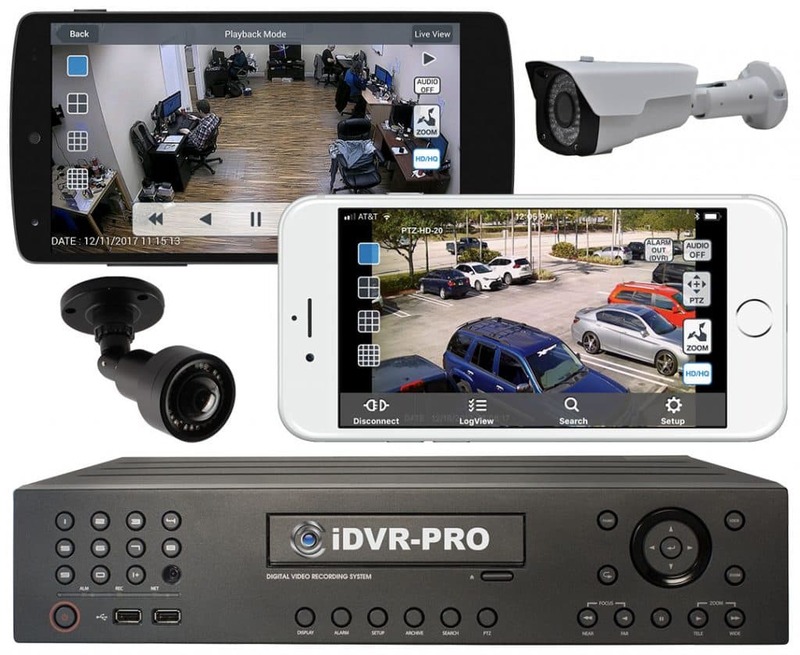 The DVR that we used for testing is the iDVR-PRO from CCTV Camera Pros which has a DVR viewer app for iOS and Android. Users can login to see their cameras live and also playback the surveillance video that was recorded at the time of the alarm. There are step-by-step setup instructions here on how to set this up. Watch this video to see a demonstration using a hidden spy camera to detect motion and send a push notification to the app. The user then plays back the video that the DVR recorded at the time of the alert using the iPhone app. The Android app works exactly the same as iPhone. 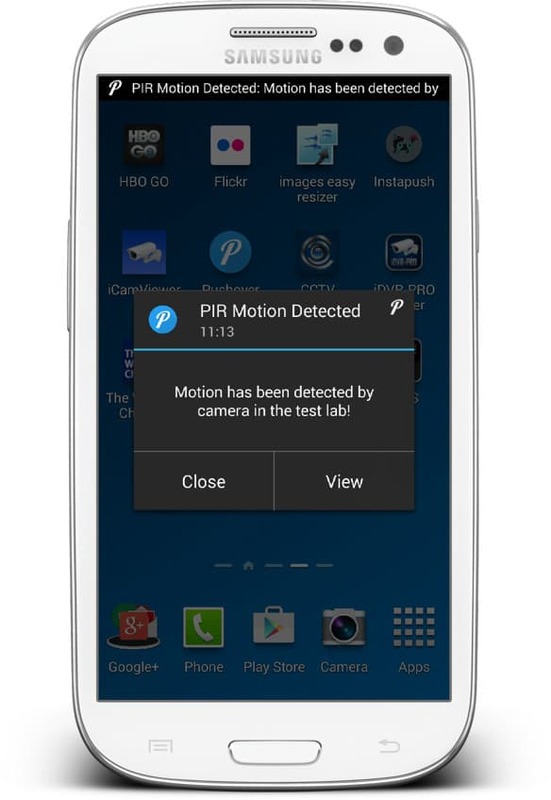 Here is a screenshot of a push notification from an IP camera being sent to a Samsung Galaxy Android phone. The IP camera used in this example is a Zavio F3210 which has a built-in PIR motion detector. The camera can be configured to send alerts based on motion from this sensor. This is a live view of the camera that triggered the alert. The user can simply launch this app when they see an alarm message. You can find the step-by-step setup instructions used to setup push notifications for Zavio IP cameras here. The email to push notification feature of the Pushover platform makes it simple to have any device that is capable of sending email messages also send a push notification. We have also tested the InstaPush platform in the past and found that Pushover is much more reliable. With a one time cost of just $3.99 per platform, we think that it is a great value. Until our manufacturers integrate push directly into their firmware, we will be recommending Pushover to our customers.